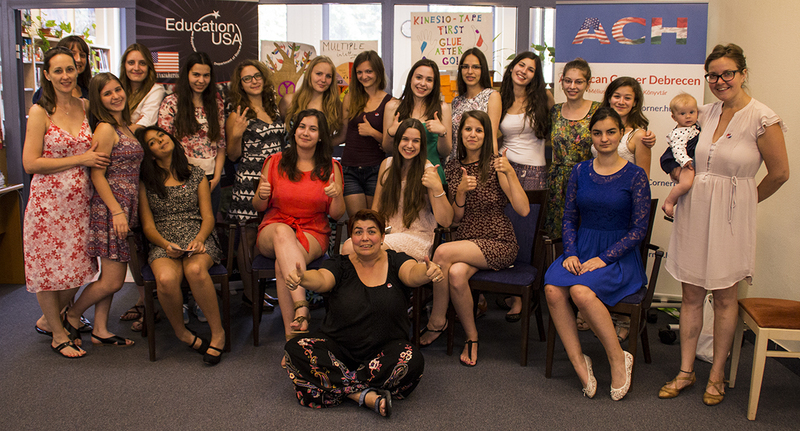 The third GROW Camp in 2015 was organized by American Corner Debrecen. The program focused on the development of leadership qualities and acquisition of skill sets indispensable to manage, and successfully organize community projects. The camp highlighted topics in the fields of public speech, communication, project management, entrepreneurship, social media, diplomacy, social responsibility, tolerance, environmental consciousness, start-ups and human and civil rights in the USA. 15 outstanding participants could fully immerse in leadership skills development with an intensive leadership training. Besides trainings, the girls were able to participate in outdoor activities – the so called Puszta Rally and Rowing – which tasks encouraged group work, and helped to reflect on leadership styles and roles. The objectives were to help participants explore challenges in their own communities, and learn how to respond actively, to such calls. Each participant elaborated on the topic of her choice during the week, and having internalized the necessary competences and the elements of public speaking – presented her topic to an audience on the closing day. Nine professional speakers devoted their time, energy and expertise to educate and guide participants through trainings. This is the third year our association – with the participation of Andrea Keresztesi – provided the public speaking training and outdoor workshops. Cheryl Francisconi, Regional Educational Advising Coordinator for Education USA facilitated intensive leadership training with Laura Byron. John D’Amicantonio, Information Resource Officer from US Embassy in Vienna had a workshop on Entrepreneurship: Social Responsibility and career in diplomacy. Éva Kopócs introduced her start-up and Zoltán Kész talked about tolerance, freedom of speech while Boglárka Falussy from American Corner Veszprém scrutinized the Civil Rights Movement in the USA. Check out the video prepared by Csilla Székely (EVS volunteer at Hang-Kép Egyesület).